Welcome to Volume 6 Issue 1 of the VOX-Pol Newsletter. If you have colleagues or friends who may be interested in the content of our newsletter, or in any VOX-Pol events and research, please forward this to them and encourage them to subscribe via our website. Follow us on Twitter @VOX_Pol for live updates and releases. 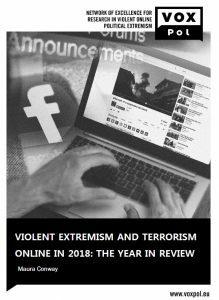 On 11 February, VOX-Pol released Violent Extremism and Terrorism Online in 2018: The Year in Review. This is the third publication in the Year in Review series, following the Year in Review 2017 and Year in Review 2016. The report treats developments in the violent extremist and terrorist online scenes in the 12-month period from 1 December 2017 to 30 November 2018. Maura Conway, Moign Khawaja, Suraj Lakhani, Jeremy Reffin, Andrew Robertson, and David Weir. 2018 ‘Disrupting Daesh: Measuring Takedown of Online Terrorism Material and its Impacts.’ Studies in Conflict & Terrorism [Online First]. Caterina Froio and Bharath Ganesh. 2019. ‘The Far Right Across Borders: Networks and Issues of (Trans)National Cooperation in Western Europe on Twitter.’ In Maik Fielitz and Nick Thurston. Eds. Post-Digital Cultures of the Far Right: Online Actions and Offline Consequences in Europe and the US. Bielefeld: transcript Verlag. Bharath Ganesh. 2018 ‘The Ungovernability of Digital Hate Culture.’ Journal of International Affairs 71(2). Amy-Louise Watkin and Sean Looney. 2018 ‘The Lions of Tomorrow: A News Value Analysis of Child Images in Jihadi Magazines.’ Studies in Conflict & Terrorism [Online First]. We’ll be in Swansea on 6 – 7 March for the inaugural Radical Right Research International Network (RIN) workshop. Co-organised and co-sponsored by VOX-Pol and Swansea University, this RIN kick-off event is invite-only, more information about the workshop and RIN will be available on our website in due course however. VOX-Pol’s third Summer School will take place at Dublin City University, Dublin, Ireland in June 2019. The first Summer School took place in 2014 and the second in 2016. The Summer School is aimed largely at PhD students and will employ a mixed-methods teaching style, including lectures, discussion, small group work, and policy labs. More information about the June Summer School, including information on how to apply will be made available shortly on our website and via our twitter feed. 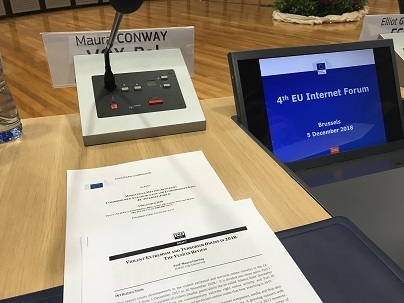 On 5 December 2018, VOX-Pol Coordinator, DCU’s Prof. Maura Conway, supplied an overview of the year’s violent extremist and terrorist online activity at the European Union Internet Forum (EUIF) annual ministerial-level meeting in the headquarters of the European Commission. A press release about the event is available on the European Commission website. VOX-Pol attended the EU Internet Forum’s Civil Society Empowerment Programme (CSEP) Campaigns Event in Brussels on 30 and 31 January 2019. VOX-Pol Coordinator Prof. Maura Conway gave the opening keynote address titled ‘Online Extremism Today: Who, What, When, Where, and Why.’ Slides available HERE. VOX-Pol and OII’s Dr. Bharath Ganesh delivered a workshop on Day 2 of the event addressing the use of insights from research to counter extremism online.